Summary and Definition: The semi-nomadic Palouse tribe were fishers, hunter-gatherers and traders of the Plateau cultural group. The Palouse lived in areas of eastern Washington, northeastern Oregon, and North Central Idaho. They are famous for breeding the Appaloosa horse that takes its name from Palouse Native Indians. What language did the Palouse tribe speak? The Palouse tribe spoke in a Sahaptian dialect of the Penutian language and called themselves the "Pallotepellows" meaning "people living in the gooseberry valley". The name 'Palouse' was derived from the French word 'pelouse' meaning a grassy expanse an reflects the prairies and rich grasslands of their territories. Who were the allies and enemies of the Palouse tribe? 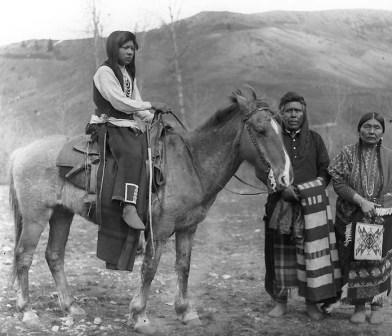 The allies of the Palouse tribe were many of the other Native American Indians who inhabited the Plateau region including the Cayuse, Walla Walla, Spokane, Coeur D'Alene, Yakama and the Nez Perce. The main enemies of the Palouse tribe were the Great Basin groups to the south, including the Shoshone, Northern Paiute, and the Bannock tribes. Where did the Palouse tribe live? The Palouse are people of the Plateau Native American cultural group. The geography of the region in which they lived dictated the lifestyle and culture of the Palouse tribe. What was the lifestyle and culture of the Palouse tribe? The Palouse tribe were one of the tribes of the Plateau Culture area. They lived a semi-nomadic lifestyle fishing, hunting, or gathering wild plants for food. The Palouse were divided into the Upper, Middle, and Lower bands and lived in pit houses in the winter and and tule-mat lodges or tepees in the summer. The introduction of the horse in the 1750's brought about a change in lifestyle and many of the people traveled to the Great Plains to hunt buffalo. The people are famous for breeding the speedy, sturdy, spotted horses now called Appaloosas, that were named after the Palouse tribe. The Lewis and Clark expedition encountered the Palouse tribe during their explorations. The rich grasslands and prairies of the Palouse territory enabled the tribe to become horse breeders and horse traders. The Palouse adopted many of the ideas of the Great Plains Indians including the use of the tepee which were covered with buffalo hides and some items of clothing also made from buffalo hides. Lewis and Clark encountered the Palouse tribe in October 1805. and Meriwether Lewis, a noted horseman, described the Appaloosa in his journal dated February 15, 1806 "Their horses appear to be of an excellent race. They are lofty, elegantly formed, and durable...some of these horses are pided with large spots of white irregularly scattered and intermixed with black, brown, bay or some other dark color". What did the Palouse tribe live in? The Palouse were semi-nomadic and needed shelters that were easy to set up and take down. They lived in one of three shelters, depending on the season. The types of shelters were a semi-subterranean pit house, a tepee or a tule-mat lodge. What food did the Palouse tribe eat? The food of the Palouse tribe included salmon and trout and a variety of meats from the animals and birds they hunted. They supplemented their protein diet with seeds, roots, nuts and fruits. What weapons did the Palouse use? The weapons used were spears, clubs, knives and bows and arrows. The Cayuse also used shields for defensive purposes. What clothes did the Palouse wear? Who were the most famous leaders and chiefs of the Palouse tribe? The most famous leaders and chiefs of the Palouse tribe included Chief Red Echo (Hahtalekin) and Chief Naked Head (Husishusis Kute). Palouse History Timeline: What happened to the Palouse tribe? The following Palouse history timeline details facts, dates and famous landmarks and battles fought by the Palouse Nation. The Palouse history timeline explains what happened to the people of their tribe. 1855: Isaac Stevens (March 25, 1818 � September 1, 1862) , governor of Washington Territory, negotiated the Walla Walla treaty with the Palouse.